From the floodlit water holes at Etosha Pan National Park in Namibia to the fascinating Robben Island, Nelson Mandela’s home for far too long before his release, the final leg of the East Africa expedition promises to deliver yet more thrills and breath-taking views. Starting in Namibia and wandering down through South Africa, there’s yet more wildlife to be seen and some of the most fiercely contrasting landscapes in the whole of the continent. Scorched desert and lush green valley’s lie back to back, providing a picturesque and sometimes startling route through the heartland of these beautiful countries. Namibia is home to some of the most extreme landscapes but none are as out of this world as Hoba, quite literally. 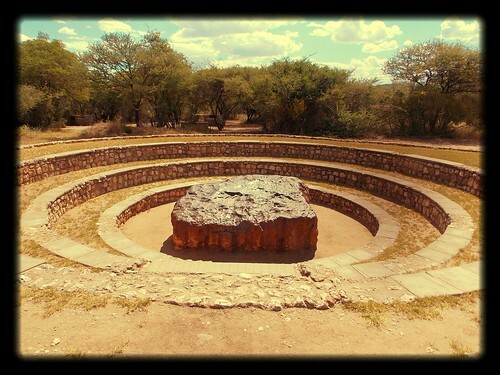 Hoba is the name given to the largest meteorite ever to have struck the earth’s surface, and which despite being excavated remains on site in Namibia where it was found. Nine foot wide and long and three feet thick, the iron meteorite weighs an eye-watering 66 tons. The sheer size of the meteorite has baffled scientists for many decades as an object of this size should have flattened the ground where it landed, causing a giant crater. None exists. Experts have speculated that the flat surface of the meteorite may have been the reason no vast crater was caused but the truth is that no-one quite knows. Despite being protected from vandalism, the meteorite can be visited by tourists in the tiny centre which has sprung up around it. Visitors can touch the meteorite or even have their photo snapped whilst standing on it for a truly intergalactic experience. Native to Africa and Asia, the cheetah is now one of the most at risk animals in the world, with an estimated 7500 left in the wild, with 6000 of these in South Africa. Despite the increasing threat of extinction, farmers in Africa continue to shoot and kill cheetah because of the wild cat’s taste for eating their livestock, particularly when their natural prey is scarce. Kamanjab Cheetah Farm offers the sleek cats the unique opportunity to thrive under protection with both wild and tame cheetahs in the grounds. Some of the animals are rescued from local farmers, bought to prevent them being killed. 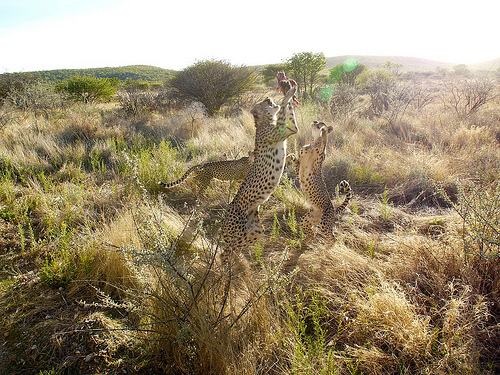 The Farm is a non-profit making organisation and its sole aim is the conservation of cheetahs. As well as game drives to see the wild cheetah in the park grounds, there’s also the chance to take part in the feeding of the tame animals, and even scratch one behind its ear! A very unique opportunity to see one of the big cats of Africa in a way you are unlikely to ever be able to experience again, the Farm is a brief yet fascinating stop on your journey around East Africa. Part of the infamous Skeleton Coast in the remote western region of Namibia, Cape Cross is a small headland which was originally claimed by the Portuguese in the 15th century. Home to the Himba tribes, the Skeleton Coast is as ghostly as the name suggests with bones and remnants of shipwrecks scattered across the barren sands. But aside from the wild and remote beauty of the dunes, Cape Cross is home to the largest colony of the Cape Fur Seal, an animal which is only found around the south coastlines of Africa. With a 200 metre walkway, visitors can spend some time watching the seals who are at their most active around October when the bulls arrive and fight for mating rights. Cape Fur Seals are unusual as unlike other species, they have external ears, giving them a very distinctive appearance. During November and December there can be up to a quarter of a million seals present in the colony, and the barks and bleating can make the area very noisy! The longest river in South Africa, the Orange River flows west towards the Atlantic Ocean from its roots amongst the mountains in Lesotho. 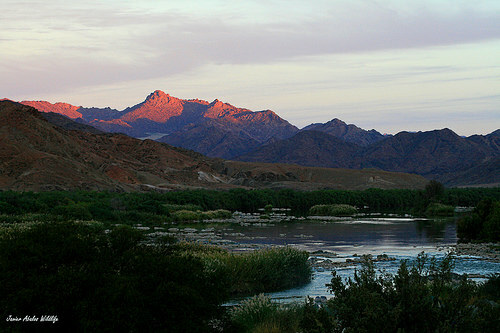 Part of the international border between Namibia and South Africa, the Orange River is particularly scenic and in many parts untainted by tourism. The water is clean and crystal clear and in South Africa is used for irrigating the precious wine-making grapes. There are many places to camp alongside the course of the river and the backdrop offers some spectacular scenery. There’s the chance to enjoy a canoe trip along the peaceful stretch of water, or to simply while away a few hours stretching out amongst some of the most glorious scenery in the region. After the hot arid deserts in Namibia, the lush valley town of Citrusdal offers a refreshing contrast. Set in the Olifants River Valley, at the foot of the Cedarberg Mountains, the area is famous for its citrus orchards and farms, the produce from which it takes its name. Visitors can watch and learn more about the harvesting of the juicy citrus fruit and can sample one of the many products on offer. There’s also a natural hot springs to relax and rest. The town is very popular with outdoors enthusiasts and you can hire mountain bikes or follow many of the hiking trails, surrounded by the heady fragrances of the citrus orchards. The final stop on the East Africa expedition, Cape Town was listed as the number 1 place to visit in 2014 by the New York Times. The region is famous for its complex yet delicately flavoured wines so where better to enjoy a wine-tasting tour than in the heart of the wine region? The Helderberg region in particular includes no less than 20 different wine producing estates. For visitors who still have a taste for adventure, Table Mountain beckons. There are many different routes and trails up the mountain, and it’s even possible to spend a night in accommodation near the top. For those that want to enjoy the unparalleled view but aren’t so keen on the strenuous climb, there’s a cable car which travels all the way to the peak. If you’ve enjoyed your expedition around East Africa and are keen to experience more of the region, there are plenty of other tours you can take. The Nairobi to Cairo expedition starts in Kenya and travels north to its conclusion in Egypt, winding its way around Ethiopia and Sudan en route. If you didn’t complete the entire East Africa trip, you could always opt for the northbound expedition, which starts in South Africa and follows a similar reverse route, travelling in the opposite direction through the continent. Wherever you travel in Africa, your experiences will be different every time. With some of the friendliest locals on the planet, and some of the most sublime landscapes, Africa is a place you will want to return to as often as you can.